These methods involve having impressions taken from which laboratory fabricated custom vinyl trays are made. A gel is placed in these trays and the trays are worn for either 15 minutes or 2-4 hours. The entire process takes 2-3 weeks of daily use. Two different strengths of gel may be used, however the higher the strength the greater the likelihood of reactions or tooth sensitivity. The tray method is recommended for badly stained teeth, such as tetracycline staining, and it may take several months of use to see significant color improvement. 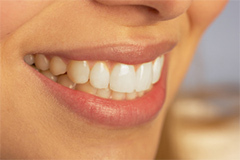 For maintenance of whitened teeth the trays should be used every 6-12 months.